Great War Photos is a new website by military historian and author Paul Reed. Born in the 1960s, Paul Reed is a leading military historian specialising in the First and Second World Wars. 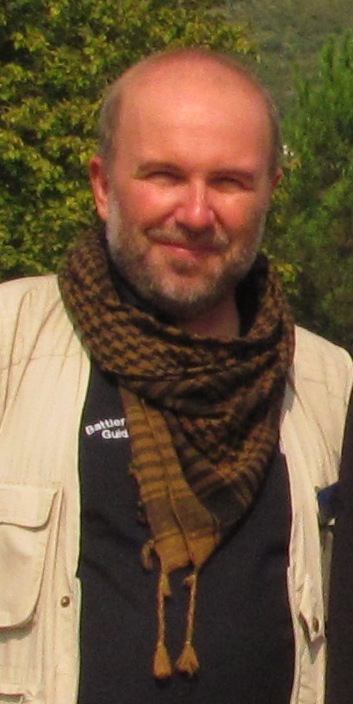 He is the author of seven books, including the best-selling Walking The Somme (Pen & Sword 1997, republished 2011) and Great War Lives (Pen & Sword 2010) as well as Walking D Day (Pen & Sword 2012). Paul also works as an Historical Consultant and Contributor for Television; most recently he was consultant on Michael Palin’s Last Day of WW1, series consultant for BBC1’s My Family At War and historical consultant for BBC2’s Dan Snow’s Little Ships and BBC1’s Dig1940. In 2011 he worked on Dig WW2 with Dan Snow and in 2012 was leading historian on Channel 5’s WW1 Tunels of Death: Messines, The Big Dig. He is currently working on projects for the WW1 Centenary during 2014-18. All of the images on Great War Photos are from originals held by Paul Reed; none are farmed off the internet and where loaned by a third party attribution is given. If you wish to use any of the images in a publication, exhibition or any aspect of the media then please get in touch. Yet another interesting historical website from Paul, I wish I had half the energy of this leading historian. I hope there are many more sites to come! I have a number of photographs that my grandfather took when posted to Egypt in the between (I think) 1915 and 1918. He was in the AOC, and think based in Alexandria, and perhaps the Command Depot at Abbassia. I wonder if you would like them for your website, I can email them? With no family to leave them to I would hate for them to disappear, there are some great ones of camp life. Thanks, Clare. Hi – sounds interesting. You can email me on ww1research@hotmail.com if you wish. I just wanted to write a quick post to say what a truely superb web site you have created here for the centenary of the First World War! They say pictures paint a thousand words and that could not be more true for this brilliant archive! Thank you for sharing the photos and information and I will certainly visiting this site every week as well as encouraging others to do so too! It was an error from yesterday; should be sorted today with a new post! Sir, I got here from pacificparatrooper’s blog link. I will need to come back and peruse your historical images! Hello Paul, I am presently collating a book on Ashby de la Zouch great war casualties which will be published next year. Its non profit making and is suported by North West Leics Council and Ashby Museum. One Ashby casualty Pte James Price was in the RAMC however, I don’t have a picture of him and can’t find anything suitable apart from the badge.Is it possible to use the stretcher bears image on your website or is it copyrighted? James has an interesting story which i am happy to email to you and add in an acknowledgement of image use in the book if it is ok.
Hi Nigel – feel free to use the image. All I ask is you credit this website. What a wonderful site! Thank you for the excellence you have designed into this. I really feel connected to this great and developing conversation as the centenary of WWI approaches. A real (virtual) community. If you think it helpful, please check out my website, which will tell you about a novel I have just completed drawing on the experiences of my father, an infantryman in the Australian Imperial Force (AIF) in France and Belgium in WWI. It’s fiction, but well researched because I’m a historian by profession and inclination. A very impressive site. I am helping to publicise our forthcoming WW1 exhibition at Fairlynch Museum in Budleigh Salterton, Devon. I’d be grateful for your permission to reproduce some of the pics on your site, obviously with acknowledgement. I would keep you posted about the ones we used. No problem, please use what you wish and just credit the site. Hi Paul. It’s been a long time but I see you are better and busier than ever. My research does involve African descent men in British regiments 1914-1918 and can be see on my website Jeffrey Green Historian – page 122 etc. Hi Jeff – good to hear from you. I’m still researching Black soldiers in WW1 and still collecting images. Have quite a few now. Will have a look at your website. Hello Paul. My girlfriend and I were looking through some old photos and found some of her great grandfather who fought in Solonika. With her permission, I would like to send you the scans she made of everything we found.